Now that Proposition 8 has been overturned, will the California constitution require all public schools in the state to teach gay marriage? I don’t understand. Schools weren’t required to do that before the election. How does leaving the Constitution unchanged impose a new requirement on them? Many people are confused by this, but the explanation is really quite simple. 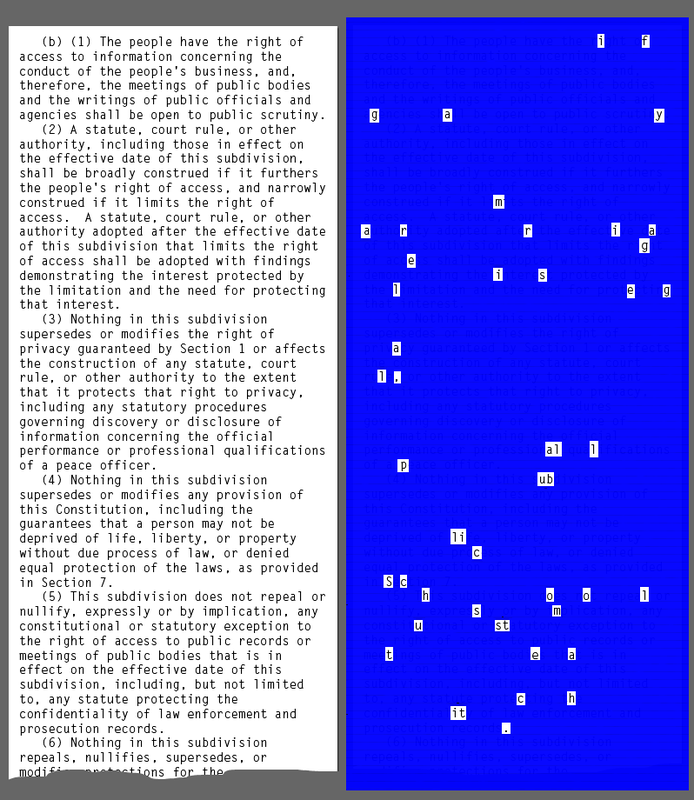 In 2004, Californians passed Proposition 59, which added Article 1, Section 3(b) to the California Constitution. Although this addition appears at first glance to concern itself only with public access to government meetings and records, legal scholars discovered in 2008 that language requiring schools to teach gay marriage had been concealed in Section 3(b), using a process known as steganography. Stega-what? Hasn’t the stegosaurus been extinct for millions of years? Thousands of years, but yes, they’re extinct. But steganography has nothing to do with dinosaurs; it’s all about hiding information. This picture (click on the thumbnail to expand it) shows how it was done. On the left is the innocent-looking text of Article 1, Section 3(b); on the right, we cover that text with an appropriate template to reveal the hidden sentence “If gay marriage is legal, all public schools much teach it”. Couldn’t that just be a coincidence? If you need more proof, consider this: Proposition 59 was known as the “Sunshine Amendment”. Sunshine leads to rainbows. Need I say more? Okay, but if no one knew that hidden message was there when they voted for it, how can it be legally binding? Do you have any idea how few people read the full text of all the ballot propositions they vote on? If judges ignored laws and Constitutional amendments just because the people who voted for them didn’t know what was in them, the entire judicial system would descend into chaos. Holy @$(*@&%#*(%)&@!!!!! That was awesome. Thank you. Next question: If I send my children to school wearing aluminum foil hats, will it prevent them from hearing the lessons about gay marriage? I’ve shared this on my Facebook page. Keep being awesome! Thanks! To answer your question — no, I don’t think sending your children to school wearing tinfoil hats is a good idea. The problem is that tinfoil blocks out everything, but what you really need is a material that will shield them from harmful ideas (like gay marriage) without blocking beneficial ones (like the Pledge of Allegiance).